Timeless (pictured): Lucy and Co. have encountered plenty of intrigue as they’ve investigated Rittenhouse’s mysterious machinations, but it’s about time we had a good ol’ fashioned murder mystery, isn’t it? 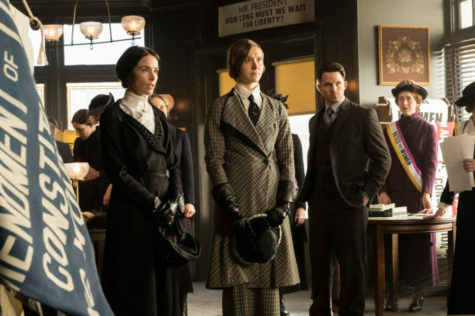 This week’s mission lands the crew smack dab in the middle of the women’s suffrage movement, teaming up with one of New York’s most notorious detectives while simultaneously trying to sort through some thorny personal issues. Grade: A-. Homeland: It was the season finale so I took at peek at a series I abandoned after its absurd season 2. There was Mandy Patinkin, still acting up a storm, and Claire Danes, showily NOT acting up a storm. I lasted 15 minutes. Grade: Incomplete.